I ended 24th in the main event with 20 itm. So nice on paper but no real result. I think I played one hand wrong but in general I was card dead. A real shame as there are little opportunities to get in this situation. Today it�s Sunday and the last chance to win something. 13:00 I play a 330 NLH and then it�s back home. Excellent result in the WPT €890 psko. I was 5th for €3490 with €980 in bounty�s. Thursday I will play the main. Now a few days of rest. I became 26th in the €500 NLHE Deepstack in HC Venlo for €891. I ended 22nd in the main. I lost KK from 88 in the final hand and won €1572. I reached day #2 of the main event in HC Scheveningen. 64 players remaining. Let�s do it. It was for a pot of approx. 1,7M which, if I would have won the hand, would certainly get me to the ft the next day. Oh well, that's poker. For the next 3 days I'm in HC Scheveningen. Tomorrow is the main event. So wish me luck. No luck in the 450 progressive bounty, but I did reach Day 2 of the 330 fo. Thursday at 18:00 is the final. The next tournament I will play is in HC Utrecht On January 29. I want to play all events there. All the best wishes for 2019!! Today I play day 2 of the main event in HC Venlo. I did some commentary during the WSOP. Here's a link to the Twitch channel of Pokercity. You can hear me after 5:20. I just came back from the WSOP in Rotterdam. I played three events there but no results. Best shot was yesterday in the 440 double stack. I ended as 40 with AJ against KJ, pfai, with a K on the flop. Next event will be the poker series in HC Utrecht at the end of this month. Last week I was in Lille, France and became of 18th of 662 players in de PSF Cup for Euro 1390. I lost the final hand with TT against AJ. I played the whole week in HC Breda. I reached one day two but that was it. The cash however went very well and made well up for all the tournament fees. :-). Next is HC Venlo but first today the last tournament. Coming Saturday I will play the team event in HC Enschede. No luck in the bounty in HC Breda, but I ended 6th in the turbo for 180 euro. No success in the WPT so far. I did manage to get to day 2 of the 1500 deepstacks, and ended 60th or so. Tomorrow I will play the 660 bounty and Saturday the team event with my son. 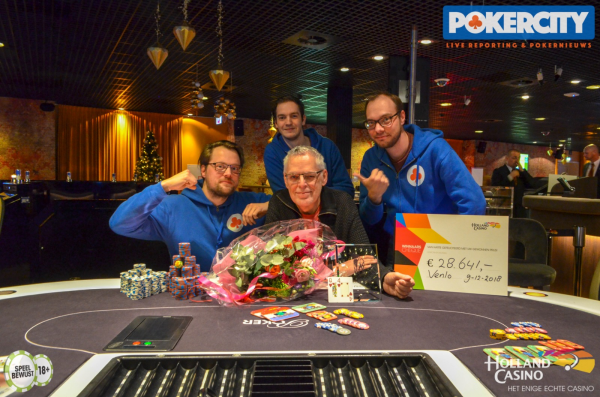 Excellent result in the �560 tournament in HC Venlo. I ended second after a deal for �10.300. So I�m very happy with this result. Next up is March 21 in Utrecht. Last weekend I played the team event in HC Scheveningen. It was fun but no result. Next week I will spent in HC Venlo during their Poker Series. I will play everything.